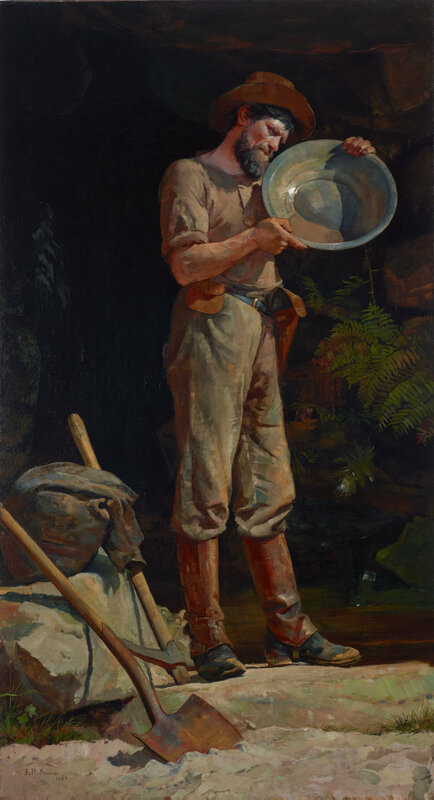 This heroic representation of an Australian 'type' is more a character study than a portrait, recalling the artist's work as a newspaper illustrator. Posed and painted in the studio, the work is formally arranged with the basic implements of the gold digger's trade carefully displayed. 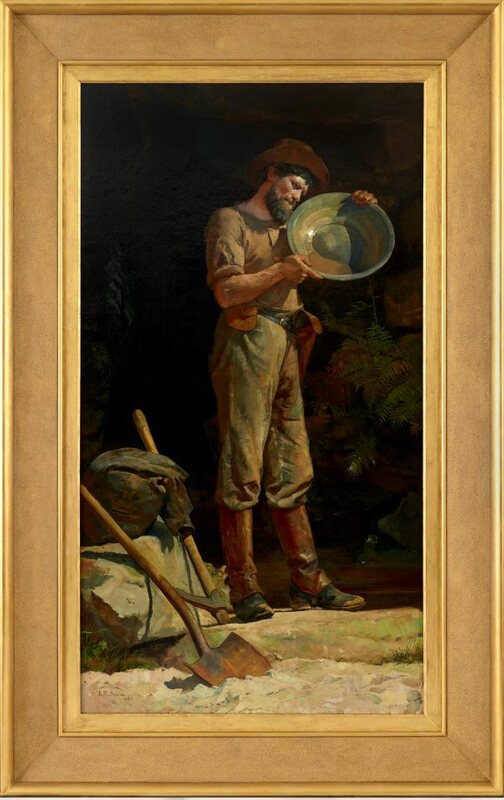 It presents an image of the prospector as a genuine Australian fellow, stained by his labours and tanned by the sun. Though somewhat constructed and theatrical, the painting retains a sense of human vitality. Julian Ashton instructed several generations of important painters through his Sydney Art School. 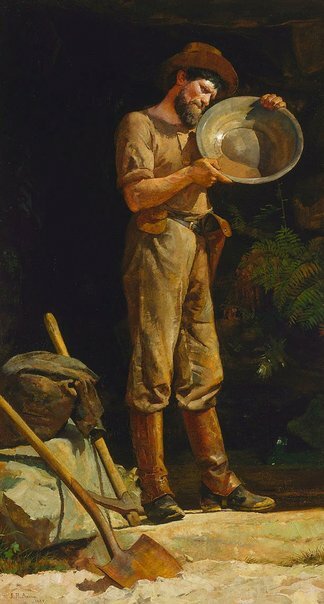 He became a trustee of the Gallery in 1888, championing the purchase of Australian art. Signed and dated l.l. corner, brown oil "J.R. ASHTON. 1889". Deborah Clark, Gold and civilisation , 'Art of the goldfields', pg. 62-77, Canberra, 2001, 62 (colour illus., detail), 63, 73 (colour illus.). Susannah Fullerton, Look , 'Brief encounters: Literary travellers in Australia, 1836-1939', pg. 29, Sydney, Apr 2009, 29 (colour illus.). Bruce James, Art Gallery of New South Wales handbook , 'Australian Collection: Painting and Sculpture', pg. 102-181, Sydney, 1999, 112 (colour illus.). Tim McLachlan, The national times: Australia's national weekly of business and affairs. , 'Julian Ashton in modern perspective', pg. 48, Sydney, 08 Nov 1981-14 Nov 1981, 48. Terry Smith, Australian art and architecture: essays presented to Bernard Smith , 'The divided meaning of "Shearing the Rams": artists and nationalism, 1888-1891', pg. 99-123, Melbourne, 1980, 107, 122. Vaurien, The Sydney Morning Herald , 'The Art Gallery', pg. 5, Sydney, 13 Dec 1890, 5. Vivienne Webb, Australian art: in the Art Gallery of New South Wales , 'Golden age', pg. 37-38, Sydney, 2000, 43 (colour illus. ), 300. Julian Ashton: essay on the artist (Volume I) , Canberra, 1981, 42, 45 (illus.). Julian Ashton (Volume II) , Canberra, 1981. Illustrations of sketches of the model used in 'The prospector'. Artists of the Australian gold rush , Melbourne, 1977, back cover (colour illus., detail). Art Gallery of New South Wales picturebook , Sydney, 1972, 77 (colour illus.). Impressionist painters 1881-1930 , St Kilda, 1971, 23 (colour illus. ), 83. The book of the fair; an historical and descriptive presentation of the world's science, art, and industry, as viewed through the Columbian Exposition at Chicago in 1893 , Chicago, 1893, 729. World's Columbian Exposition, Chicago, 1893: Catalogue of the exhibits in the New South Wales Courts , Sydney, 1893. Catalogue of the National Art Gallery of New South Wales 1891 , Sydney, 1891, 66. Sydney Morning Herald , 'The Art Society's Exhibition', pg. 5, Sydney, 30 Dec 1876, 5. Trustees of the Art Gallery of New South Wales: Minutes 31.8.1880-4.8.1891 , Sydney, 1880-1891, 8 October 1889. Centenary of Federation: South Australia. South Australia, Federation and the twentieth century (Episode one: Utopia and the great Southern Land) , Australia, 17 Oct 2001, 0:18.37-0:18.40 (colour illus., detail). 'Utopia and the Great Southern Land' was broadcoast on ABC television 17 October 2001. The Australasian coin & banknote collectables magazine , Canowindra, May 2001, front cover (colour illus.). Special issue on gold and gold discoveries in Australia. Our guardian angels , Sussex, 2001, 41 (illus.). The Art Gallery of New South Wales Bulletin , 'Close-Ups of the Collection', pg. 34, Sydney, Aug 1996-Oct 1996, 34 (colour illus.). Gold Fever! Life on the diggings 1851-1855 , Canberra, 1994. Listed in catalogue under the heading "The true picture?". No cat. number.